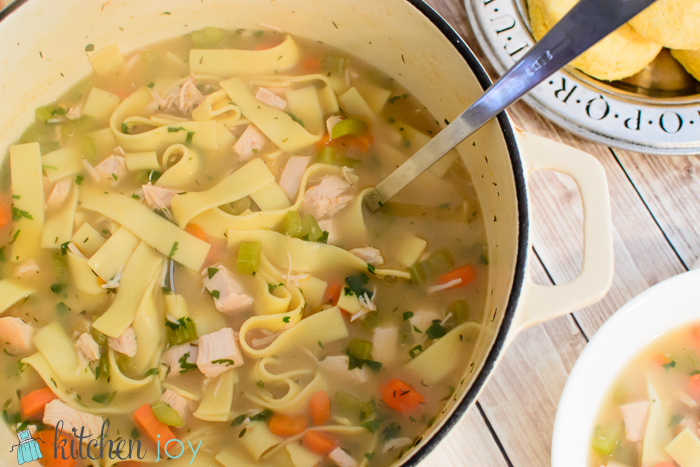 When it comes to soup, homemade is just better than store-bought. In my previous experiences making homemade stock (usually chicken), I didn’t roast the bones in the oven prior to making the stock like I did this time. This method gives a more complex depth of flavor. What better way to use up leftover turkey? 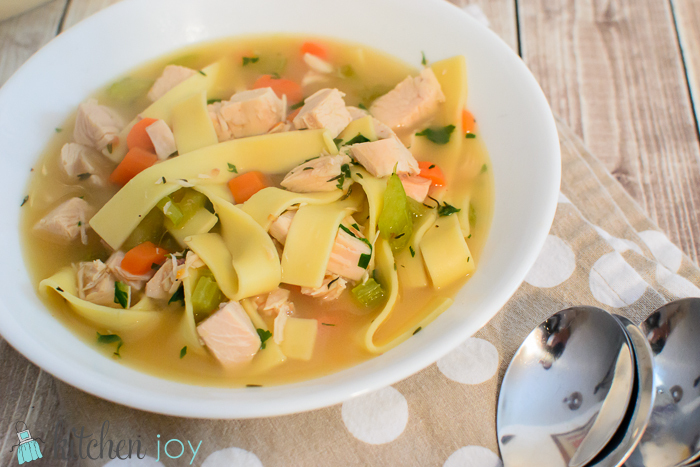 I will definitely be making this Homemade Turkey Noodle Soup again next Thanksgiving. Place the turkey carcass, bones from wings and drumsticks, neck bone, onion, carrots and garlic on a large rimmed baking sheet coated with cooking spray. Bake, uncovered, at 400° for 1 hour, turning once. Transfer the carcass, bones and vegetables to an 8-qt. stockpot. Add 4 qts. cold water; set aside. Pour remaining cold water onto the baking sheet, stirring to loosen browned bits. Add to pot. Bring to a boil. Reduce heat; cover and simmer for 3-4 hours. Cool slightly. Strain broth; discard bones and vegetables. Allow stock to cool, stirring occasionally. Cover and refrigerate overnight. The next day: Skim fat from broth. Cover and bring to a boil. Reduce heat to a simmer. Meanwhile, in a Dutch oven, bring 3 qts. water to a boil. Add noodles and carrots; cook for 4 minutes. Add celery; cook 5-7 minutes longer or until noodles and vegetables are tender. Drain; add to simmering broth. Add cubed turkey; heat through. Stir in the parsley, salt, thyme and pepper.